Taste what Austrian craftsmanship can do with the finest alpine water, unique botanicals, and sloe fruit to transform a cherished British classic. Prost! Hans Reisetbauer began his obsession of distilling in 1994. On his family farm-house in Axberg, Austria he planted the first orchards from which he distilled his first Eau de Vie’s. The dedication and care for top quality fruits, distillation and innovation brought him Worldwide fame, and consequently brought his spirits to restaurants, to bars, to all corners of the globe. On his constant search for the taste he decided to create a Gin that would demonstrate his vision of how Gin should really taste like. The Blue Gin Vintage Dry is a pot-still, small batch Gin, made with one of the softest waters around and produced from ‘Mulan’ wheat which is locally sourced. The first batch was made in 2006 where 50 different botanicals were used, but nowadays, with constant improvements, "just" 27 botanicals are used (the main one still being Juniper from Macedonia). How did Sloe Gin making come to an Alpine valley? The still-masters at Blue Gin just loved Gin, and it turns out that Austrian Tertiary spring water is naturally soft and really good for it. The rest is history. The sloe is the fruit of the blackthorn bush, and people have been steeping the berries in Gin for hundreds of years … it is one of those combinations of flavors that just works. It is a classic home-brew liquor made all across the United Kingdom. Sloeberry Blue Gin is less sweet, relying more on the natural flavors and sweetness of the sloe berry itself to highlight the botanicals in their classic Gin. This simplicity allows individual flavor components to shine so try Sloeberry Blue Gin in cocktails like a Sloe Gin Fizz, or Sloe Gin Negroni for a special treat. 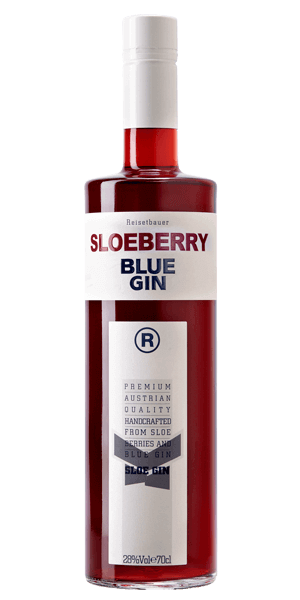 What does Reisetbauer Sloeberry Blue Gin taste like? The Flavor Spiral™ shows the most common flavors that you'll taste in Reisetbauer Sloeberry Blue Gin and gives you a chance to have a taste of it before actually tasting it.